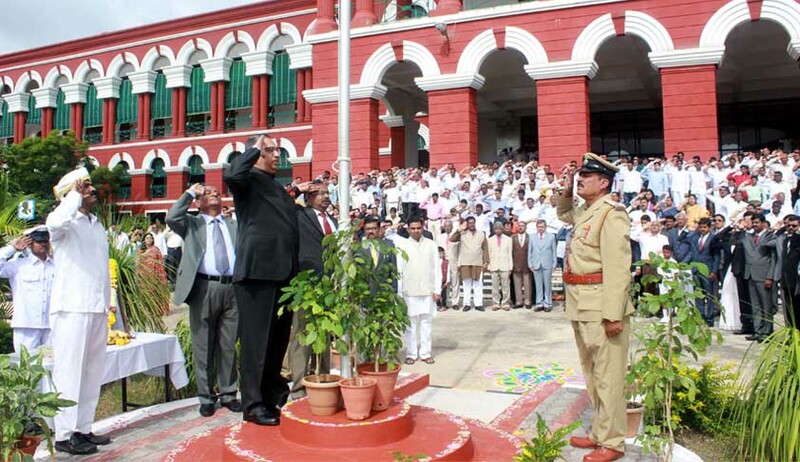 The Allahabad High Court has dismissed a public interest litigation for a direction to ensure daily recital of the national anthem on the premises of the high court as well as district courts, tribunals and other such establishments. The petition was filed by a practicing advocate and contended that even courts should rise each morning and begin the day with the recital of the national anthem. It was submitted that Article 51(A)(a) has been incorporated as a fundamental duty under the Directive Principles of State Policy and the Supreme Court's direction indicates it to be a duty of every citizen to show respect to the national anthem. Accordingly, the apex court has issued directions for playing the national anthem in all cinema halls in India before the start of a feature film and all present in the hall have been obliged to stand up to show respect to the national anthem. A division bench of Justice Amreshwar Pratap Sahi and Justice Sanjay Harkauli observed that it is an honour for a responsible citizen to remember and perform his duty. “We, citizens of the country, also owe this to our Nation, and to realize this, our Constitution embodies within itself the chapter of Fundamental Duties introduced by the 42nd Amendment Act, 1976. There are some duties which remain patriotically undivided, and one of them is to show respect to the symbol of the Nation, whether it is the National Flag or the National Anthem, and it is for this reason that the same has found place in Article 51A (a) of the Constitution of India”. The bench observed that the national anthem no doubt is also an expression of patriotism and our belief in the Constitution that governs the nation. But it also observed that true patriotism is not the belonging of any political party as it neither knows latitude nor longitude. “It only fosters love for one's Country and respect for one's belonging to a Nation. The sense of belonging is therefore an inherent feeling and not a matter of compulsion. The feeling is therefore natural and reaffirms the sense of belonging to a Nation”. Whether such duty and patriotism should be a matter of chant every morning in a court of law? The bench said the high court is not only run by rules, but also by deep-rooted traditions that have been fostered from time immemorial, and particularly after India has gained Independence being governed by the Constitution. The court made it clear that there has been no tradition of singing of the national anthem either inside courts or in its offices as a matter of daily routine every day, and to the best of the information to this court, such is also not the practice in the Supreme Court. According to the bench, there is no mandate of such a performance, and the high court, being an institution of judicial autonomy, has nowhere framed any such rule that may run counter to the letter and spirit of a fundamental duty. There is no mandate either under the law for such recital and chanting of the national anthem on a daily routine basis nor is there any tradition to that effect. The bench said there is a difference between a prayer to the divine and the recital of a national anthem. A routine prayer to the divine is a self-imposed discipline which one does for spiritual gains. This is pure morality and belief in religion and is personal. “The recital of a National Anthem cannot be equated with such a divine prayer so as to compel its recital by the officials of a public institution as a routine exercise so as to instill any patriotism or sense of duty. In our opinion, the performance of a duty is more essential, as work is real worship,” the court said. It observed that ‘to respect the national anthem is to believe in it and believe in the true ideals of our Constitution’. “A performance of a daily singing of the National Anthem in Courts may not by itself be a reflection of Constitutional respect,” it added. In December 2016, the Supreme Court had rejected an application filed by BJP leader and advocate Ashwini Kumar Upadhyay to make the national anthem compulsory for all courts throughout the country on technical grounds.